I am quite a fan of Al Brooks' first book, "Reading Price Charts Bar by Bar", despite the fact that we trade very differently. "Countertrend setups in strong trends almost always fail and become great With Trend setups…"
In a strong trend you will find all manner of reasons to suspect that the trend is ready for reversal. 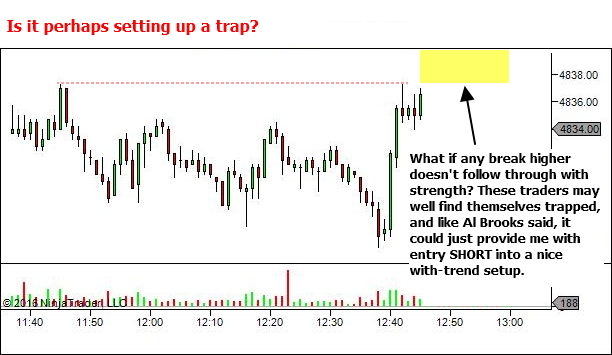 And you'll find yourself easily tempted to enter counter-trend. But more often than not, it's a trap. 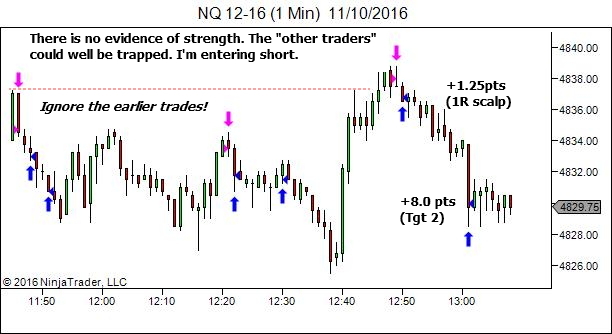 When you feel this strong desire to trade counter-trend, do NOT trade. Be comforted by the fact that others will notice it as well. And that they'll enter. Then watch their position, waiting patiently until they're trapped. The failure of their counter-trend position will often provide a great entry for you, back in the with-trend direction. 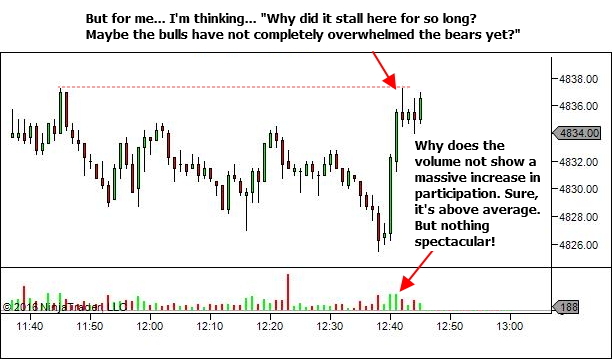 Those who trade the YTC Price Action Trader methodology will be very familiar with this concept – timing our entry off the failure of "the other trader". 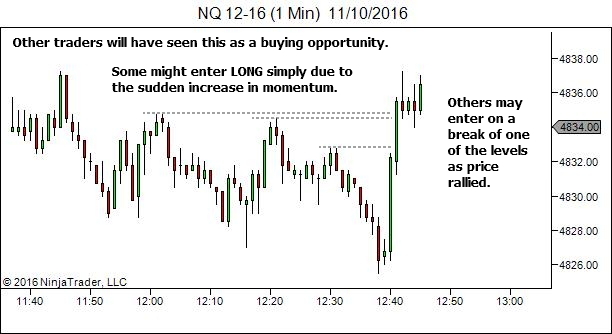 This concept came to mind on Tuesday, as I felt a strong desire to enter counter-trend against a strong bearish trend in NQ. Actually, I'm not happy with the exit decisions. But that's something for me to explore in my trade review process. In terms of setup and entry… I love this one. Keep this in mind next time the price bars scream out for you to fade a strong trend. Is it actually a trap? And is better opportunity perhaps available if you stand aside and wait for the "other traders" to be caught? And regarding the example here, what would your bias have been if this set up had occurred at HTF support? I do consider S/R as well. But I didn’t discuss it in the article. I try to limit articles to one to two concepts only. Add too many factors into the discussion and it starts to get confusing. There was an S/R level at 4834.75 (7th October Low). 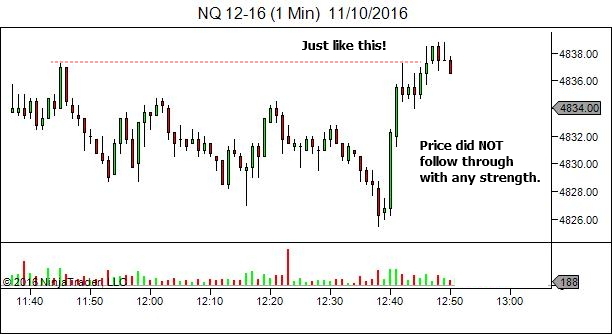 Price broke below that at 11:18 and then held below for the next hour and a half. The level is now resistance. The setup discussed in this article did pop slightly above the level. That’s where the stall and entry short occurred. So from that perspective you could consider it a BOF of resistance rather than just a pullback. But the trade is essentially the same. Given the close proximity of the level, perhaps I should have included discussion of it in the article. 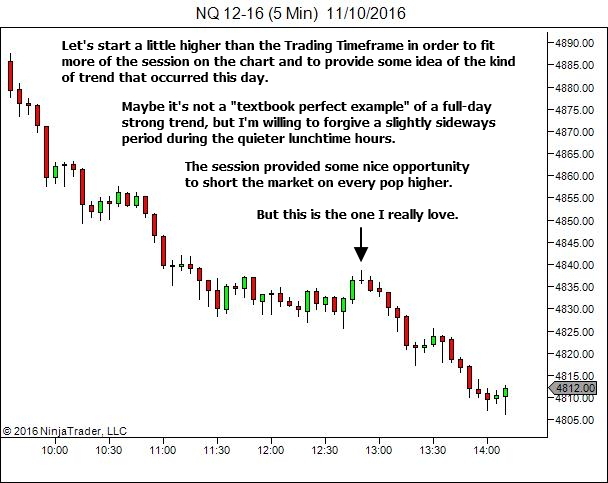 But the fact is that while trading I was paying VERY LITTLE attention to it. The size of the downtrend (massive… check the daily chart) had me ONLY interested in shorts at this stage. Until the market offers signficant evidence of sustained bullish pressure, why try to fade something so strong? Generally speaking, how long do you like price to hold below HTF level to call it changed from S to R and vice versa? And also request you to come up with an article about the last 2 statements in your reply: How you fade a strong move by seeing sustained bullish pressure. Q. how long do you like price to hold below HTF level to call it changed from S to R and vice versa? A. Once I determine “price acceptance” below the level. There is no fixed rule. It’s discretionary. Q. And also request you to come up with an article about the last 2 statements in your reply: How you fade a strong move by seeing sustained bullish pressure. Hi lance, you always say, “Aim to determine where large numbers of traders are going to be wrong in their decision making” as to profit from those large number of trapped traders. so does that conclude that i shall look to go against the large number of traders, for example, the bear flag..the pole of that flag consists of large number of sellers. so shall i look for to buy on that bear flag if opportunity comes? regardless of strong strength of the sellers? am confused a little. You need to consider context. And it’s not necessary to be a large number. Look for traders trapped when they’re fighting the bias of the market. 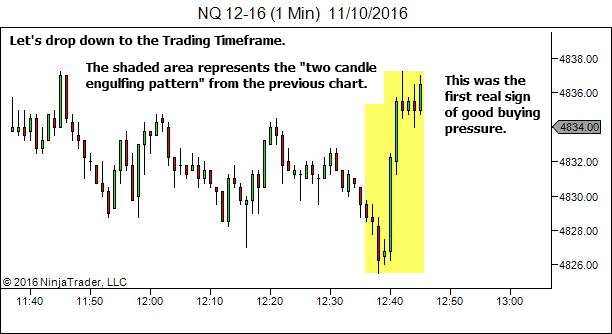 In the example given in this article, note the underlying context from the earlier images – a strong and persistent trend day. 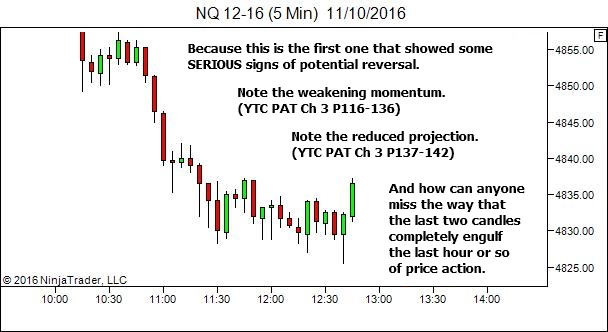 Then we find the price action which tempts people into believing there is a reversal – strength against the market. 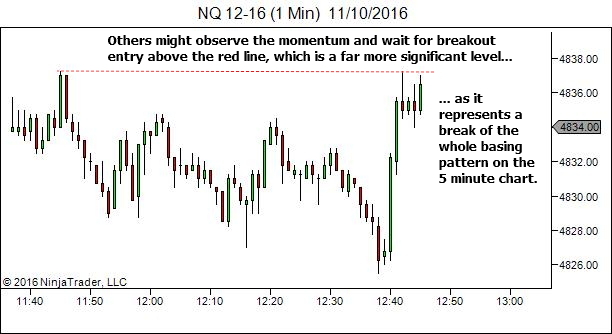 And we look for a trap – a break of the swing high which stalls and fails. 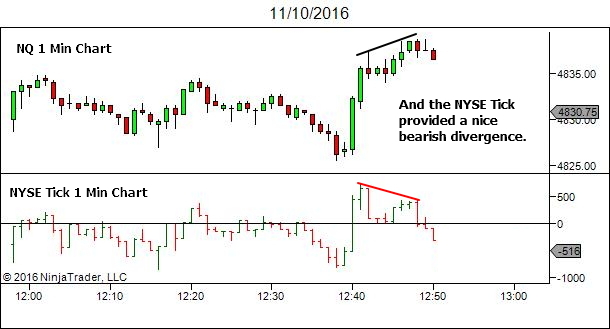 In your example of a bear flag – it depends upon the context of the market. Not the pattern itself. Look wider. Where is that pattern occurring within the larger structure. Oh, now i understood. Thanks for explaining Lance, have a good day!